The access road to the sacred Somawathiya Chaithya is being re-constructed at Rs 2.7 billion to withstand floods as it has been identified as a major flood prone area in the North Central Province. Ports and Highways Deputy Minister Nirmala Kothalawala said the road from Polonnaruwa to the Somawathiya sacred shrine via Thambhala and Sungawila (40 kms) is being developed with Bank of Ceylon funding. "The work involves construction of drains, culverts and bridges. "Although previous governments did not go ahead with the road development project, President Mahinda Rajapaksa has intervened to commence the construction of the access road," he said. The deputy minister made these remarks while inspecting the construction of the road recently. 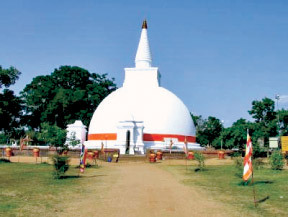 The Somawathiya shrine which drew a large number of devotees in the past, was in an abandoned state due to LTTE terrorist activities for nearly three decades.